Steamboat’s popularity continues - Ikon Pass got us going even stronger this year with skier visits and now another recent article and Bloomberg study shows Steamboat Springs ranked 5th on the list of best places to own a vacation home. One problem with a vacation “home” comes vacation “maintenance”. This is why you may consider the low maintenance option of a townhome with a well managed home owner association (HOA) such as the townhomes at Fox Willow. Fox Willow townhomes are a smaller complex of only 8 residences, so there isn’t the excitement during popular vacation times as most other condos and townhomes in the mountain area of Steamboat. The development also has 1.4 acres of common area designated as green space. As popularity of Steamboat Springs continues, so does the idea of owning a vacation home here. Don’t wait until inventory is less as we often see in summer. Less inventory pushes higher prices. My new listing at Fox Willow available as of 4-19-19 is worth a look as the inventory under $725,000 for a 3 bedroom home with a 2 car garage is limited. Real estate in Steamboat with 5+ bedrooms and shuttle to the slopes hard to find under $1 million. 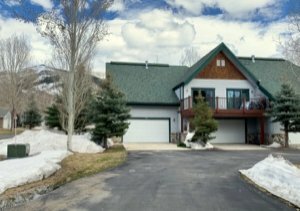 Steamboat Springs is a family friendly town resulting in a demand for rentals with 5 or more bedrooms according to Michael at Steamboatescapes.com . If you have a large family, lots of friends, or travel in groups, then you have probably run up against the challenge to find a place with quality finishes and great location offering a shuttle to the slopes that won’t break the bank. The fee charged for rentals can be a sticker shock because the cost to puchase one of these homes exceeds $1,000,000 for the most part. As of the date of this real estate blog, there are only 7 homes / townhomes in the mountain area near the ski slopes of Steamboat Ski Resort with 5 or more bedrooms priced under $1,000,000. Most of the 7 need some work with the exception of a spectacular property located above the Rolling Stone Golf Course and appropriately named Eagles Overlook - priced now at $669,000 to sell fast. Eagles Overllook HOA pays the gas bill for snow melt, shovels your deck, maintains the elevators and saves for capital improvements. Come to ski or golf and don’t worry about working on your home while here. If you want to offset the cost of owning your home, potential for rentals income is very attractive at Eagles Overlook and cash flow is much better than many of the luxury townhomes closer to the slopes. The Steamboat Pilot reports that Storm Mountain Ranch dev­­eloper Jeff Temple and his wife, Kim, have sold their home on Water Song Lane on a prime 70-acre tract fronting the largest pond in the development for $5.3 million. The 4,855-square-foot home sold for the equivalent of $1,091 per square foot, albeit on twin 35-acre lots at Storm Mountain. The buyer’s broker said her client acted when the price was reduced a second time to $5.7 million, and the deal was put together within a week. The home is all on one level with a family-style floor plan, and the home is easy to maintain, the broker said. It has a high level of finishes but succeeds in looking unpretentious. “It’s a house you can make a home,” she said. Going… going… GONE! The last bank owned home in the immediate vicinity of Steamboat Springs is under contract. Homes with 3 or more bedrooms in the Downtown, Fish Creek and Mountain area of Steamboat Springs are now selling quickly. There may be more inventory on the horizon, but as of today, the last home listed as a REO (Bank Owned) on the Steamboat Springs MLS is under contract. Since January 1st, 2011, 44 homes have either sold or are pending sales that are scheduled to close soon. What’s left for Steamboat foreclosures are some incredible deals on the newly constructed Long View Townhomes in the $300k to $400k price range. Approximately 25% of the bank owned sales are for homes over $1,000,000, so it not just the lower priced properties of Steamboat Springs market that are in demand. Historically low interest rates coupled with higher demand and less inventory means it’s time to get off the fence!.